Delicious Vegan Macaroni Salad is a perfect side for Picnic, potluck or Barbecue. 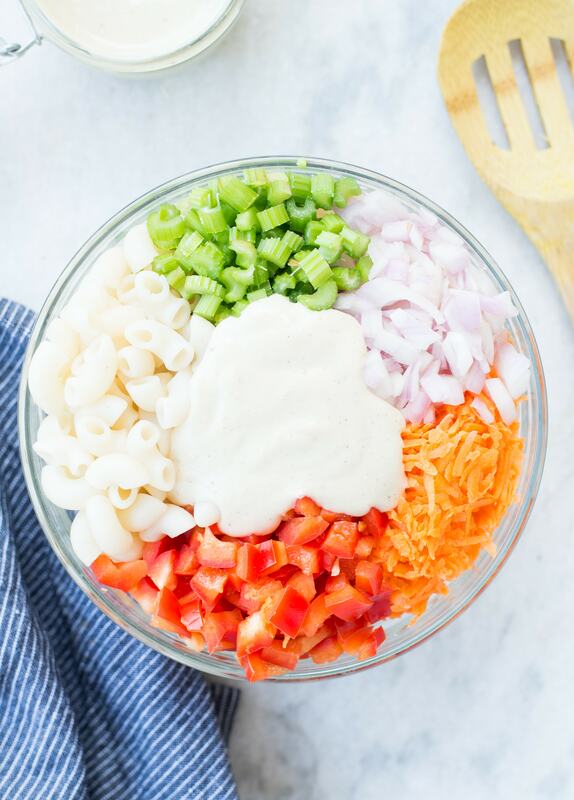 This Vegan Pasta salad is creamy with crisp vegetables and a light Tahini Cashew Dressing. 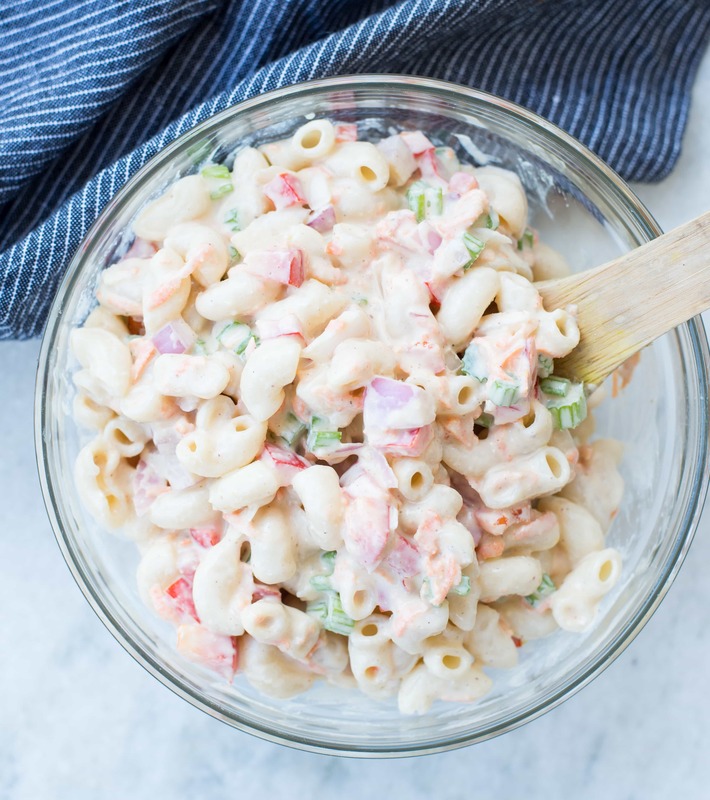 Vegan Macaroni Salad is a vegan twist to the classic Macaroni Salad. 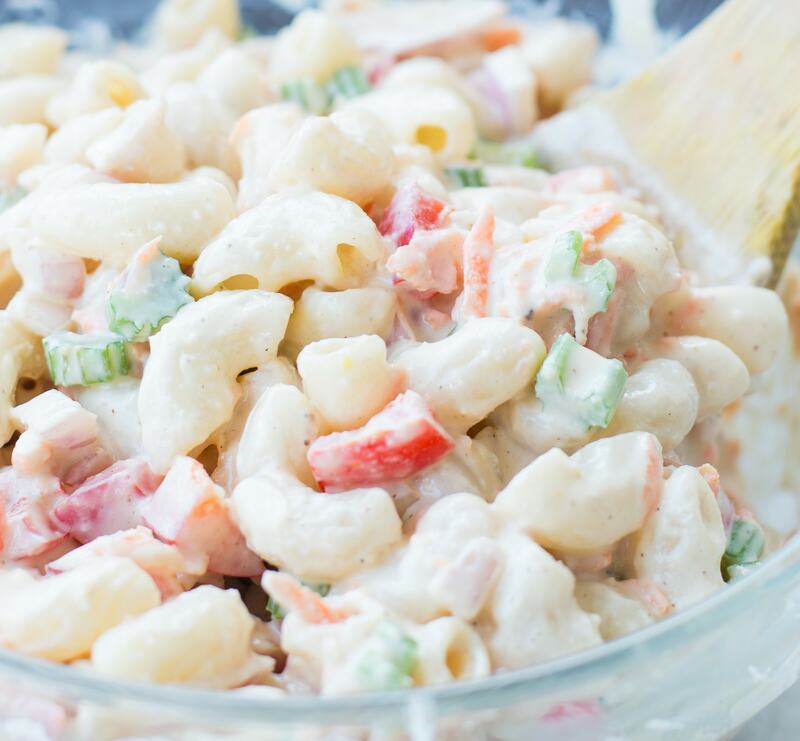 This is the best Macaroni Salad you will ever make. 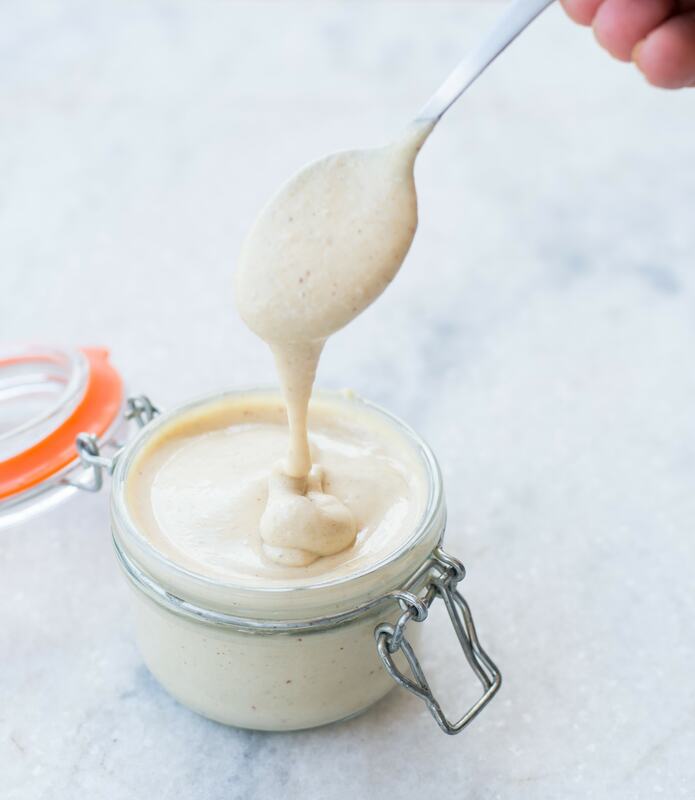 The Tahini Cashew based dressing is light, creamy and best possible substitute for mayo. I am sure you will not miss the mayo dressing here. I am not a vegan but I do respect people who have chosen a Vegan Lifestyle. This recipe was an experiment that became successful. Came across Macaroni Salad recipe while browsing. I had all the ingredients at home except Mayo. So took a little risk and used tahini cashew sauce instead of mayo. The salad was really delicious a with a good balance of flavours. WHAT GOES INTO MACARONI SALAD? 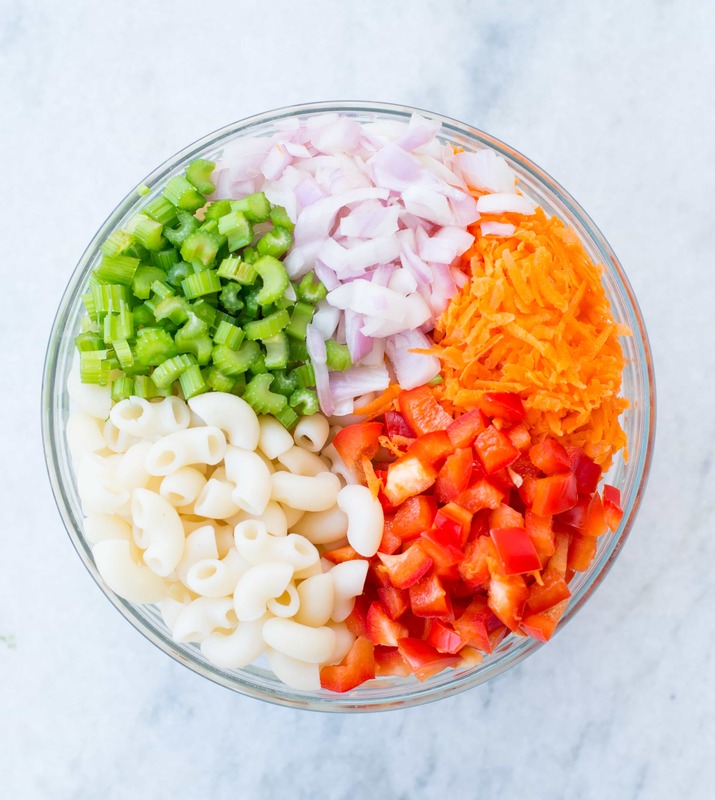 Macaroni salad ingredients are very easily available and mostly kitchen staple. 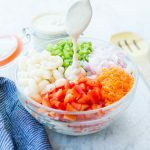 Like any other pasta salad, this Macaroni salad has elbow pasta, fresh crunchy veggies and a delicious creamy dressing. Most common veggies are red onions, red peppers, celery, carrots. You can also add chopped pickles, broccoli and peas to it. The vegan pasta salad dressing has tahini, cashew, soy milk, dijon mustard, apple cider vinegar in it. It is light, creamy. HOW TO MAKE MACARONI SALAD? Recipe for Macaroni Salad is pretty simple and easy. The very first step in making any pasta salad is cooking the pasta right. It is very easy to overcook pasta. Overcooked pasta is a pasta salad is the last thing you would want. Lumpy and sticky pasta is definitely a big no-no. Start with bringing a big pot of water to boil. Season lightly with salt. Seasoning with salt it quite important here. Once the water comes to a boil, add your pasta( in this recipe your macaroni). Cook till al dente. Drain in a colander and run pasta under running tap water. Running under tap water helps to bring down the temperature and stops further cooking. I also drizzle little EVOO to prevent pasta from sticking. While the pasta is cooling down, prepare the veggies. For best result, use fresh vegetables. Fresh veggies give that necessary crunch. I have added shredded carrot, chopped onions, celery and red bell pepper. broccoli also works well. I have blanched the florets before adding. This Vegan Salad dressing is so damn good!! It has the right consistency with a good balance of flavours. Tahini gives a nutty taste and cashew makes it creamy. The dressing is as good as the classic macaroni salad dressing. 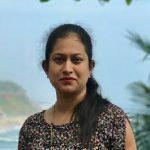 You can easily adjust the dressing as per your preference. Blend together tahini, cashew, apple cider vinegar, dijon mustard, sugar, soy milk, salt and pepper. To adjust the consistency add reserved pasta water while blending. CAN WE FREEZE MACARONI PASTA SALAD? Off course you can. The salad tastes better if allowed to sit in the refrigerator for a couple of hours. But if you are planning to do preparation a day ahead, then it is a bit different. I would recommend not to mix the dressing with rest of the ingredients and store for more than few hours. Because the vegetables might turn soggy. You can prep the pasta, veggies and the dressing a day or two ahead. Store pasta and veggies in an airtight container. Store the dressing in a separate container. Serve this Vegan Macaroni Salad with Vegan main dishes like..
Bring a big pot of water to boil. Season lightly with salt. Cook elbow pasta as per package instruction. Darin pasta and let it cool. Mean while prepare onion,carrot, celery and red bell pepper. In a food processor add tahini, cashew, dijon mustard, apple cider vinegar, sugar,salt and pepper. Add half of the soy milk. Keep adding slow milk until the desired consisteny is reached. In a big salad bowl add pasta, onion, celery, red bell pepper, shredded carrot. Add the desired amount of salad dressing. Mix everything well. Serve along side you favourite main dish or as a meal by itself. This looks like one delicious salad and super creamy! Perfect addition to all those summer bbqs!